You MUST submit a time record every two weeks. This time record will indicate regular hours worked, hours of leave used (vacation, sick, or floating holiday), and any overtime hours, if worked. The time record must be submitted even if no overtime or leave hours need to be reported. You will be required to submit a biweekly timesheet in the manner which your unit instructs. If you are a civil service employee currently submitting biweekly timesheets, you should continue to submit in the manner in which you do now, unless otherwise instructed by your unit. continue to submit your biweekly timesheet in the manner in which you do now, unless otherwise instructed by your unit. 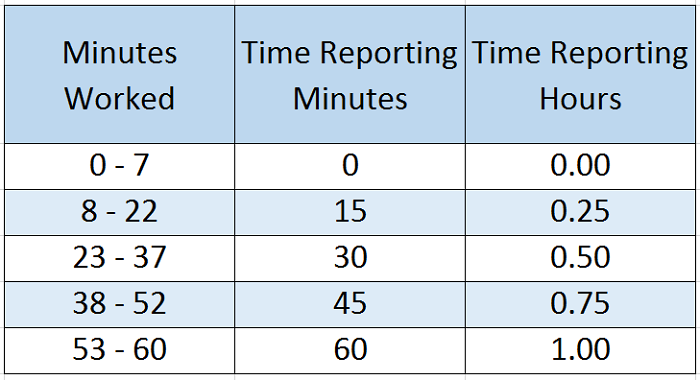 Time worked is reported in 15-minute increments (rounding conversion schedule provided above). Your unit will provide guidelines regarding the authorization of overtime. Your weekly schedule can be flexed or have temporary change from your normal work schedule to maintain 40.0 (for academics) and 37.5 (for civil service) hours for the week.